I began this journey with creating the excuses for doing the build in the first place, and then purchasing the various parts. Now here is the fully assembled thing. Some final thoughts. 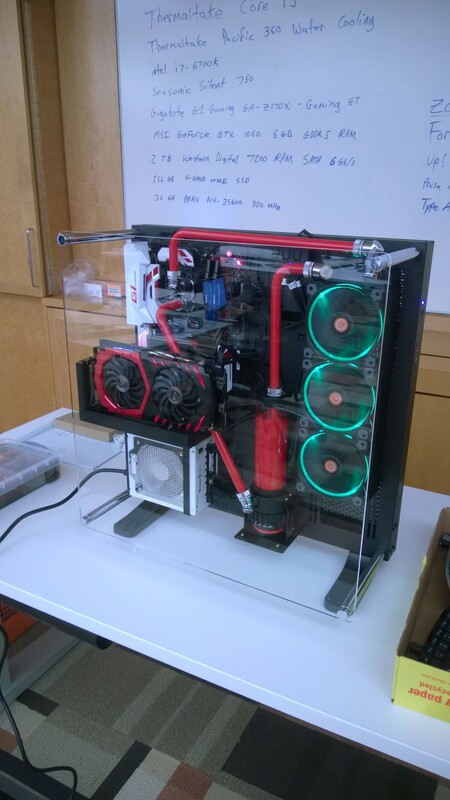 The scariest part was doing the water cooling piping. I practiced tube bending on a waste piece before embarking on the final pieces. Like a plumber, it’s helpful to plan out where the pipes are going, do some measurements, then do bending on cutting. Really I was afraid that once it got assembled, it would be springing leaks all over the place ruining the fairly expensive electronics. When I first put the tubing together, I tested by running some distilled water through the system to flush things out. In the end, there were no leaks, and everything runs beautifully, and cool. Having done this once now, I can see redoing the tubing at some point to make it more fancy, but for now, it works just fine, and looks cool. One thing of note, this thing is really quiet. You literally need to almost stick your ear into the various fans to hear them at all. The power supply fan is dead quiet. This is dramatically different than the power supply on my shuttle PC, which I thought was fairly quiet. Now the Shuttle PC sounds like a jet engine in comparison. The fans on the cooling radiator are whisper quiet as well, and provide those cool lighting effects to boot. Really this thing shows off best in a fairly dark room where the various glowing light effects can be seen. The noisiest part of the entire build is actually the disk drive. You wouldn’t normally think of that, but when things are absolutely silent, to the point where the AC fan in a room is way louder, in a quiet room, the steady rumble of the disk drive is the most notable sound. I’m loving it so far. I feel a sense of accomplishment in putting it together. I got to use it as a visual aid for the latest cohort of the LEAP class. 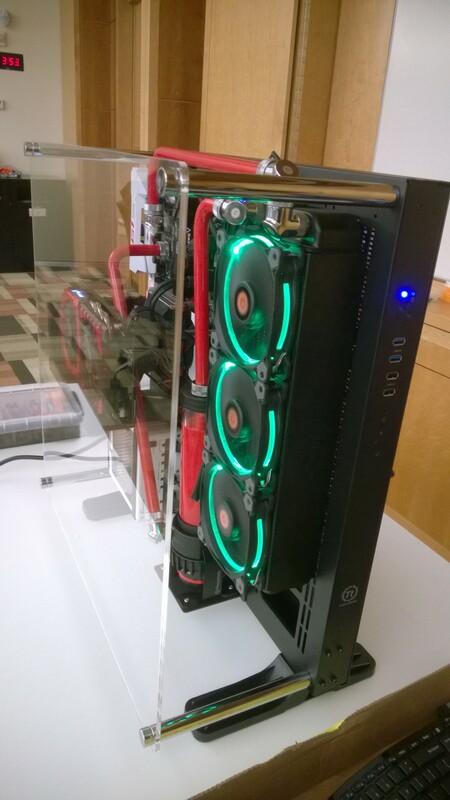 Having a transparent case makes it easy to point at stuff, and the liquid cooling just adds a nice wow factor. As far as the OS is concerned, I installed Windows 10 Pro. I figure even if I want to run Linux, I can simply use Hyper-V to create Linux VMs and go that way. Given that the graphics card can run 4 monitors at a time (I think), that’s more than enough to give me the illusion of a common desktop, with two Windows screens, and a third with Linux on a VM. So, it’s a sweet combo. As for the excuse to be able to run the Vulkan API on a modern graphics board, that’s coming along. I had to install Visual Studio, build a LuaJIT, and dust off the cobwebs of my Vulkan ffi binding. All in due time. For now, the screaming machine is being used to type this blog post, and otherwise sitting beside my desk looking cool. I’ll have to design a desk specifically for it just to add to the DIY nature of the thing.